Shirley Jordan is Professor of French Literature and Visual Culture at Queen Mary University of London, UK, where she writes about contemporary women’s writing, displacement and hospitality, and city photography. Author affiliation details are correct at time of print publication. Christoph Lindner is Professor of Media and Culture at the University of Amsterdam, the Netherlands, where he writes about cities, globalization, and visual culture. Author affiliation details are correct at time of print publication. Temporary projects in vacant shops, commonly known as ‘pop-up shops’, have become a common sight on many high streets in cities in the global north. The adjective ‘pop-up’, from its onomatopoeic origin in a light explosive sound, refers to something that appears or occurs suddenly and unexpectedly. Transposed into visual terms, the word conjures images of folded cut-out pictures standing out from the flat page of a book and of windows superimposing on a computer screen: unrequested visual events that distract and interrupt an existing activity. By extension, pop-up spaces have become the epitome of urban interruptions: short-term spatial appropriations that appear unexpected and unsolicited, visually and spatially occupying a site with something different and eye-catching. In interrupting the everyday of the city, ‘pop-ups’ are expected to produce both visual and experiential urban encounters that stand out against a backdrop of alleged urban sameness. In the emerging interdisciplinary body of literature analysing temporary uses, pop-up practices in cities have been associated with forms of ‘insurgent’ (Hou 2010) and temporary (Haydn and Temel 2006) urbanism characterized by ‘unplanned’ approaches to the production of space (Oswalt, Overmeyer and Misselwitz 2013). Pitted against the alleged rigidity of top-down interventions by private and public agents of urban development, temporary and ‘pop-up’ spaces appear to embody a progressive critique that appeals to ‘tactical’, as opposed to strategic (De Certeau 1984), or spontaneous and amateurish (Deslandes 2013) approaches to transforming cities. Whether such a ‘tactical’ urbanism, encompassing a range of ‘small-scale, unsanctioned, community-led urban interventionist activities’ (Mould 2014: 530), interrupts or reproduces existing global dynamics of interurban competition and place branding, is an open debate. In this chapter, I contribute to this critical discussion by analysing the recent proliferation of community-oriented ‘creative’ pop-up shops in the context of the recent global recession in London. A little studied ‘mainstream’ genealogy of pop-up shops situates their appearance in the cultural urban vocabulary of the early 2000s, when media and marketing agents began to use the term to designate ‘new’ spaces of consumption. ‘Pop-up retail’ described limited time stores promoting particular brands or new product ranges, particularly in Western global shopping capitals such as London and New York. The commercial success of ‘pop-ups’ as a form of marketing lay in ‘surprising consumers with temporary “performances”, guaranteeing exclusivity because of the limited time span. It’s about buzz, and about new try-out and testing techniques’ (Trendwatching 2004/2010). The temporariness of the space is promoted as an opportunity to generate micro-tourism since ‘the draw of pop-ups is the sense of urgency they create, to get there “now” before it disappears, as well as to have been one of the few who were there to have had the experience’ (Cambie 2010). Alongside commercial uses as an explicit marketing strategy, temporary uses of vacant shops have also gained currency and visibility in association with the cultural and third sectors. Practitioners across a broad spectrum of ‘creative’ professions have taken upon themselves or have been tasked by private and public urban agencies with producing visual and performative fillings of urban shops that have become vacant subsequent to the global financial crisis of 2008. As with commercial pop-ups, this visual response to the recessional urban landscape of high street closures and stalled redevelopments rapidly spread across cities from New York and London (Bishop and Williams 2012) to less known urban centres in the global north. 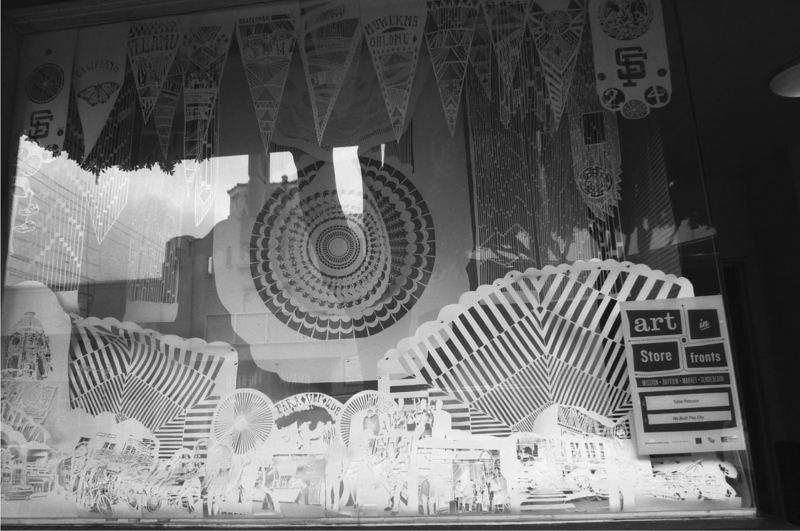 These pop-ups often displayed explicit visual references to the communities of the neighbourhood where they took place, as is visible in the use of traditional Mexican papel picado (Figure 9.1) in an Art In Store Fronts shop in San Francisco’s Mission District (San Francisco Arts Commissions 2010). In the United Kingdom, since the global recession, pop-up shops have grafted themselves onto a longer history of social and artistic projects in contexts of urban regeneration. Practitioners and organizations appropriated empty shops for non-profit, social and artistic uses (Meanwhile Project 2010; Berry-Slater and Iles 2010) to produce visual interventions in urban vacancy combined with a more explicit coordination of programmes of local community uses, often framed through a do-it-yourself aesthetics evoking urban countercultural imaginaries (Iveson 2013). In this context, a blurring of distinctions between political and promotional temporary appropriations of urban spaces has led to ideas of ‘temporary autonomous zones’ (Bey 1985/2003) being discussed side by side with site-specific theatre productions and architectural festivals (Bishop and Williams 2012). Figure 9.1. Art in Store Fronts, Mission District, San Francisco (April 2010). Photograph by the author. Drawing on self-representations, interviews and ethnographic observations collected between 2010 and 2012 in London, this chapter aims to offer a critical analysis of the ways in which community-oriented practices in vacant shops articulate and project distinct urban imaginaries. In the first part I will explore the connection between temporary spaces and discourses of urban regeneration that inform the framing of pop-up shops for both artistic and social uses. The second part will address how this framing is made visible in forms of self-representation of pop-up experiences in inner London and their shared aesthetics. Finally, I will shift the focus to the performative dimension of such aesthetics as co-constitutive of the experience of the spaces by visitors and passers-by. By engaging with the processes of meaning-making that accompany moments of encounter and interaction, I argue that the aesthetics of community-oriented pop-up shops can generate frictions and unintended readings, which throw into relief important tensions about their position in relation to wider urban cultural dynamics. In attending to these interactions I will develop a set of reflections around the cultural politics of imaginaries of temporary urban uses as interruptions. These days [. . .] art is not only enlisted to drive regeneration but to quite literally fill the shop fronts of its empty high street. In the Western cultural imaginary, artistic uses of vacant urban spaces often self-identify in relation to established genealogies around the flourishing of artistic avant-garde practices in contexts of urban decay caused by processes of de-industrialization and depopulation. Greenberg has identified late-1970s’ New York as an important reference point for the mythology of creative re-appropriation of derelict buildings, later promoted through policy interventions, marketing campaigns and the newly established urban lifestyle magazine industry (2008; 2011). Ever since, the imaginary of ‘creativity amid urban decay’ (Zukin 2008: 729) has become something of an urban cultural trope and a focal point of symbolic identification between art practices and marginalized urban areas. With the development of global dynamics of place marketing and interurban competition (McCann and Ward 2011) and with cultural activities becoming ‘increasingly valued in terms of their ability to foster a new image for the city’ (Edensor et al. 2010: 2), since the 1990s cultural spaces have been considered indispensable ancillaries of plans of urban intervention and neighbourhood renewal. In the United Kingdom since the mid-1990s, government departments and councils, such as the Department for Culture, Media and Sport and the Arts Councils, have promoted community-oriented cultural activities as part of the multiple discourse of culture-led regeneration (Miles and Paddison 2005; Pratt 2009). In that context, culture and creativity have increasingly been understood as means to engender and accompany processes of social as much as economic ‘reconstruction’ of urban spaces (Vickery 2007; see also Böhm and Land 2007). In the context of the global proliferation of ‘creative cities’ discourse (Peck 2009) and the quest for distinctive urban marketing elements, Claire Colomb’s analysis of public projects of vacant space reuse in Berlin has indicated temporary spaces as a new fertile ground for public and private city promoters (Colomb 2012). Both Colomb (2012) and Peck (2011) have noted how the urban imaginaries promoted through temporary uses in Berlin and Amsterdam respectively explicitly drew on a mimicry of histories and aesthetics of subcultural and political urban movements, taking ‘processes of cultural commodification and artistically inflected place promotion, which have existed since the 1970s, one step further’ (Colomb 2012: 142). Historically, temporary uses of vacant spaces have also come to play an important role in the re-invention of the symbolic economies of cities in recessional times. During the 1991 to 1993 recession, Zukin (1995) observed the temporary uses of unfinished vacant shop fronts for contemporary art exhibitions in mid-town Manhattan. For Zukin, they exemplified her thesis that in times of economic recession the symbolic economy performs a takeover of productive economies, enrolling cultural practices to ‘produce and promote imaginative reconstructions of the city’ (1995: 17) to be projected onto abandoned scenarios and to serve the purpose of ‘selling’ urban growth. In the UK, ideas of creative and community-oriented ‘pop-up shops’ have become ever more popular with local authorities struggling to counter perceptions of urban decay in the aftermath of the global credit crisis of 2008. National urban and cultural policies combined with specific funding for the arts to promote artistic and community uses of vacant shop fronts in struggling cities and inner-city neighbourhoods (DCLG and DCMS 2009; ACE 2010). Vacant high streets, perceived as the most visible symptom of the recession, became a crucial site of policy intervention. A key part of the rationale of community-oriented creative pop-up shop schemes lay in the promise to dispel negative urban perceptions of social and economic decline, and ‘to attract and retain visitors’ (DCLG and DMCS 2009: 2). In conjunction with public policy, since 2010, a range of third sector organizations stepped into the breach to act as intermediaries and promote, administer and manage temporary uses on the ground. Organizations such as Meanwhile Space CIC, for instance, have been directly involved in setting up temporary shop front reuse in London and advising other organizations and practitioners through reports based on best practice (Meanwhile Project 2010). Their argument for temporary and ‘meanwhile’ uses identifies vacant shops as wasted resources to be put to use – ‘activated’ – through community and creative activities ‘while something else is waiting to happen’, that is, in that in-between space between vacancy and redevelopment or demolition (Ferreri forthcoming). In order to analyse the kind of ‘imaginative reconstruction of the city’ promoted by these practices at times of recession, I will begin by focusing on the performative ways in which they fulfil their task of countering negative perceptions through a do-it-yourself, ‘creative’ and community-oriented aesthetics. Self-representations of community-oriented pop-up shops share a fairly established common aesthetics (Deslandes 2013; Mould 2014), which can be observed in their online as well as offline presence. As temporary events in the city, there is a practical reason why many pop-up shops have a highly visible online profile: the lifespan of a pop-up shop ranges from a few days to a few months, and the use of social media to constitute audiences and participants at short notice is absolutely crucial. In this sense, pop-up shops live an interconnected double existence in the online space of mailing lists and forum discussions promoting their activities, including websites that visually document their practice, and in the offline spaces of the streets where the project physically takes place. As the former often leads to the latter, self-representations circulating through online platforms should not be understood as secondary to the experience of encountering the space, but as co-constitutive of the production of expectations around the pop-up shop itself, at least for a certain section of the population, as will be discussed later. A significant first visual element in the aesthetics of pop-up shops is constituted by the colourful bunting line stretched across the shop window, which becomes the clearest demarcation of a space of difference. The use of bunting arises from a shared sense that pop-up shops should signal their temporariness by a visual affiliation with the cultural temporary space par excellence: the festival. As explained by Lucia, the organizers of a community-oriented temporary shop called Make:Do (Figure 9.2), a pop-up shop ‘is supposed to be an interruption, a disturbance, and shake up the timings and the rhythm of the place. [. . .] It’s like a festival. The whole point of a festival or a holiday is that you are breaking from your rituals and your everyday life, to interrupt it, to do something else’ (Interview 17 August 2011). Figure 9.2. Images of the open shop as appeared on the Make:Do blog (November 2010), courtesy of Make:Do. The bunting frames the reclaimed shop as a site of festive celebration, literally flagging the space as different from the rest of the street. 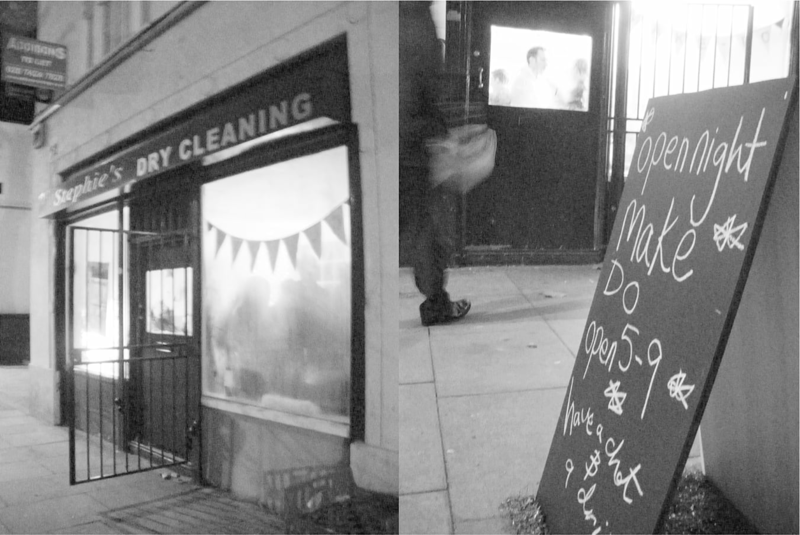 In the case of Make:Do, it signalled the re-opening of the former local dry cleaning shop, whose name was still visible on the frontage, as something else that clearly interrupted the ‘rhythm of the place’, a small road within a residential area. Accompanying the bunting, the pop-up shop also displayed wooden A-boards, signalling that the site was open, with handwritten signs drawn in chalk on black board, which conjured an aesthetics of makeshift spontaneity and informality, borrowed from shared imaginaries of self-organized urban spaces such as independent community cafes, squats and do-it-yourself cultural venues. A second element that often appears in the self-representations of pop-up shops, and that indeed informs the aesthetic of the space as experienced by passers-by and visitors, is the presence inside the shop and in adjacent spaces, of recycled, reused or up-cycled objects and furniture. The seating inside, and at times outside, is often constituted by untreated wood planks, donated second-hand furniture and repurposed objects. The diversity of uses within the space ensures a degree of casualness and slight disorganization of the everyday appearance of the shops. The study of the material organization of many of these temporary spaces revealed that the limits of low or inexistent budgets pushed practitioners to make use of personal as well as more formal networks to obtain the basic furnishing of the shops, from discarded chairs to borrowed equipment. In the analysis of Deslandes, this DIY aspect of the ‘meanwhile aesthetics’ in recessional times can be seen as a response to conditions of financial poverty through the recourse to cultural capital (2013: 223). The makeshift aesthetics of these spaces is not only accepted, but also, importantly, celebrated within the discourse of temporary use as re-using wasted spaces and materials and ‘making do’ with whatever is available. A third and final element in the shared aesthetics of pop-up shops is the visual articulation of the argument of ‘place activation’ through the contrast between photographs of the vacant site before the project, and of the same site in use. Such photographs are usually posted on an online forum as well as in online reports addressed at funders and prospective pop-up shop participants and coordinators (Meanwhile Space CIC 2010). Besides documenting the process of reuse, these images serve the double function of evidencing the project’s positive impact on negative perceptions of vacancy, as well as performing a call for participants and visitors to be involved. The ‘before’ and ‘after’ visual narrative device was present, for instance, in Space Makers Agency’s online documentation and promotion of its pop-up activities in the Granville Arcade in Brixton Market, which comprises a street market and a series of early twentieth-century covered shopping arcades, in the inner London borough of Lambeth. The arcade presented many vacancies, partly also due to the recession, and was threatened with demolition. In 2009, Space Makers Agency coordinated a programme of performances, pop-up galleries and designers’ temporary shops, many of which were leased rent-free on a temporary basis, The project was initially intended to last three months, but was extended to one year (November 2009 to November 2010) and led to the rebranding of the place as ‘Brixton Village’ (Space Makers Agency 2010). In 2010, a ‘before and after’ image composition appeared on the Agency’s webpage, and was circulated and reposted on several blogs as an illustration of the positive impact of pop-up projects in urban spaces. The image combined two images side-by-side. 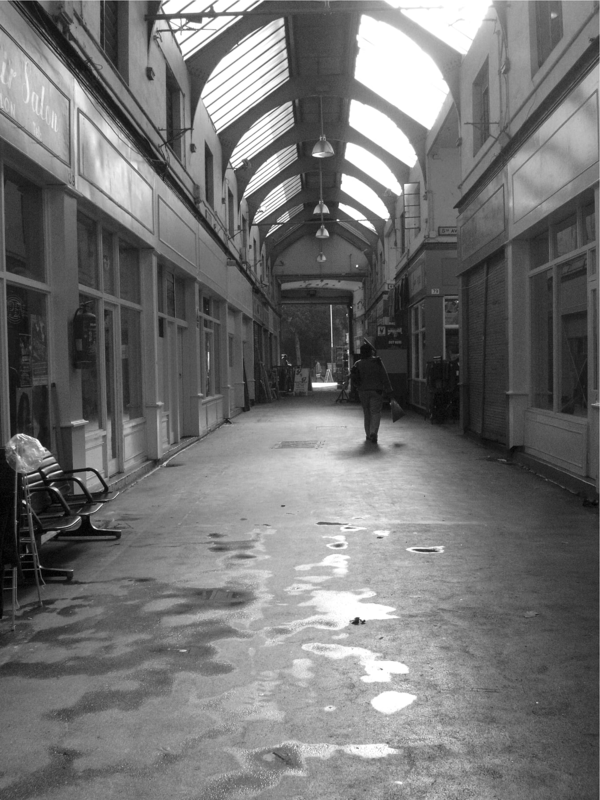 On the left-hand side, the ‘before’ image (Figure 9.3, black and white in the original), was used to convey a sense of dereliction and abandonment increased by a lone figure in the background walking away from the viewer. This functioned as an element of visual contrast to the ‘after’ image, on the right-hand side, the colour photograph of a crowd watching a performance in the arcade, under a colourful bunting, in a festival-like atmosphere of informal sociability. Figure 9.3. Granville Arcade ‘before’. Photograph © Sara Haq. http://www.sarahaq.com, formerly on Space Makers Agency’s Brixton Market webpage (2010). The three elements outlined so far, the festive, the repurposing and the ‘place-activation’, blend together to conjure an imaginary of hand-made, amateurish, artisanal and localized urban uses and encounters. The idea of activation and repopulation of ‘empty’ spaces, with all its neo-colonial implications that can only be briefly mentioned in this chapter, is informed by a nostalgic vision of ‘authentic’ urban spaces of face-to-face interaction, which presents pop-up shops as oases in which to reconnect to an imagined local community in a world dominated by mass-produced goods, fast global flows and impersonal encounters (Zukin 2008; see also Moses 2013). Against a backdrop of recessional vacancy, community-oriented pop-up spaces project an imaginary of decelerated urban life, the idea of urban ‘village’, as well creativity or ‘slow art’ (Lindner and Meissner 2015) that appears to resist and interrupt London’s hectic everyday rhythms and promote a more localized and personal approach to space. Beyond their self-representation, these imaginative reconstructions operate by enrolling visitors into the space through ‘drop in’ hours and programmes of events. Under the bunting and across the open door past the A-board on the pavement: people are drawn in to visit, interact and make use of the space. Returning to the two meanings of the term ‘pop-up’, unexpected appearance and unexpected occurrence, it is time to attend to the performative encounters taking place within such a highly choreographed stage, and to the experiences, expected or unintended, that they give rise to. The claim of pop-up shops to ‘activate’ urban vacancy involves a promise to generate different urban experiences that attract and intrigue visitors into using the space. If pop-ups are to be understood as interruptions simultaneously of urban vacancy and of the everyday experience of high streets, associated as they are with festivals and fairs, the second meaning of ‘happening’ or ‘occurrence’ points more specifically in the direction of an embodied and relational dimension of encounter and interaction. As observed earlier in relation to Lucia’s explanation, pop-up shops are to be interpreted as interruptions, as a breaking from everyday life’s rhythms and rituals. Visitors to the spaces are meant to understand this exceptionality, suspend their everyday activities and embrace the temporary space as an urban event. By extension, they are expected to approach the space as something radically different from its surroundings, and to experience of it through a suspension of daily frameworks of interpretation. In practice, however, visitors encountering pop-up spaces draw on situated frameworks of reference, and on the complex histories of specific urban sites that are far from the inert backdrops that pop-ups are meant to interrupt and ‘activate’. The issue of the legibility of pop-up spaces and the different social encounters they aim to generate cannot be addressed without an analysis of the ways in which people experience such spaces and their performance of interruption. As argued by Degen, Desilvey and Rose in their study of everyday experiences of designed spaces, it is necessary not to presume that ‘inhabitants of urban spaces are a submissive audience of the spectacle, anesthetized by aestheticization and dulled by design’ (2008: 1908). Drawing on two examples of encountering community-oriented pop-up shops that generated unintended readings, I analyse the performative dimension of pop-up spaces through an embodied and situated understanding of the cultural, social and political dynamics informing the processes of meaning-making. The first example of unintended reading refers to a pop-up shop opened by Meanwhile Space in Aldgate, Tower Hamlets, for 3 months (January to April 2011). The shop consisted of two large rooms with floor to ceiling front windows, located on Whitechapel High Street, by a busy crossing and on the corner of the popular nightlife destination of Brick Lane. The front windows were adorned with bunting, an A-board on the pavement announced upcoming events and the right-hand side of the room had been converted for a short while, among other activities, into a carpentry workshop (Figure 9.4). The space was presented as ‘dedicated to making the most of unused spaces for the benefit of local communities’ (Meanwhile Space CIC n.d.) and rapidly attracted a wide range of people, from passers-by to artisans and arts practitioners seeking a space to exhibit their work locally or to start a practice. The response to the pop-up shop was quite exceptional and proved to be one of the most popular meanwhile spaces; in the words of a Meanwhile Space organizer, ‘at Whitechapel certainly we were bombarded with people coming through the door wanting to do stuff [. . .] everyone wanted to have a go’ (Interview 1 July 2011). The shop also caught the attention of members of the East London activist scene, for whom the neighbourhood and broader area were an established site of political activity and spaces, including nearby Freedom Bookstore, on Angel Alley, and the London Action Resource Centre (LARC) on Fieldgate Street. A recent history of squatted activist sites was also fresh in the collective imaginary. In particular, within a short distance had been located the recently evicted RampArt Social Centre (2004 to 2009), on Rampart Street, and Non-Commercial House (2009 to 2010), on Commercial Street, a squatted shop front used for meetings, film screenings, a bicycle repair workshop and a ‘freeshop’ to swap clothes and other donated objects. A member of this scene, Ann, came across the Meanwhile Whitechapel pop-up shop in early 2011. As a young activist involved in a squatted shop front turned social centre called Well Furnished (February to June 2011), in the nearby borough of Hackney, her experience is indicative of the imaginaries evoked by the site and its potential unintended readings. In March 2011, she decided to visit the shop to attend an event that combined a screening of the documentary by French independent filmmaker Agnes Varda, The Gleaners and I (French: Les Glaneurs et la Glaneuse 2000), with the book launch of FREE: Adventures on the Margins of a Wasteful Society (Hibbert 2010). Both film and book are explicit investigations of practices of re-appropriation of waste in contemporary Western societies. Varda’s film is a journey through practices and histories of gleaning both in urban and rural France. Similarly, FREE is a critique of food and space waste in London based on the author’s first-hand experiences of practices of ‘skipping’, i.e. salvaging food from bins, and squatting. Figure 9.4. Photograph of Meanwhile Whitechapel pop-up shop taken by the author on 26 February 2011. Thematically, the topic of reclaiming food and space going to waste perfectly befitted the frame of a vacant shop temporarily reclaimed for social and creative activities, and presented political overlap with Ann’s own experience and interests as a squatter organizing a reclaimed shop front. The aesthetics and declared intentions of the pop-up shop, in combination with this particular cultural event and the wider frame of a neighbourhood, were easily associated by the activist with reclaimed urban counter-cultural spaces and their ‘freeconomy’ of recycling, reusing and redistributing wasted resources for free. She was therefore extremely surprised to discover that the event was ticketed and that the entrance would cost five pounds. Reflecting on her disappointed expectation that the event be free, she described the way the project was presented as ‘ambiguous’ (Conversation 12 March 2011). The incorporation of visual elements borrowed from DIY urban countercultures, combined with a localized recent history of temporary appropriations, raised expectations of a radical political space that were frustrated by the material arrangements of the meanwhile space. While Varda’s documentary explores the legal, social and economic dimensions of gleaning as a pre-capitalist form of rural commoning (Linebaugh 2004), the space where it was screened celebrated ideas of appropriating urban ‘waste’ while remaining firmly within the sanctioned boundaries of event organizing and legalized spatial use. Ann’s reaction to the ambiguity of the situation and her unintended reading thus signal an important tension between the aesthetics and the economic and legal conditions of the pop-up. Underneath a veneer of countercultural re-appropriation, lie a watertight ‘meanwhile’ legal agreement and a social enterprise economic model that are antipode to the radical critique of capitalist dynamics of enforced scarcity, and its subversion through direct re-appropriation, upon which squatted spaces are constituted. The second example of unintended reading of community-oriented pop-up shops refers to a series of temporary shop front projects that took place in the Elephant and Castle Shopping Centre, in Southwark. If in Whitechapel the interpretative reference point for activists was constituted by squatted pop-up shops and other radical political spaces, in Elephant and Castle the reading of the temporary shops was framed by the long-term local history of urban regeneration plans. The Shopping Centre is a remarkably understated place on a very busy roundabout in the middle of the Elephant and Castle Opportunity Area, a zone designated by the London Plan for intensified redevelopment, which included the site of the now demolished Heygate Estate (London Borough of Southwark 2010). In the early 2000s, after years of semi-abandonment and lack of refurbishment, the centre was acquired by a real estate management and development company, with the aim to redevelop it as part of the comprehensive regeneration plans for the area. With the financial and credit crisis of 2008, however, the regeneration plans were stalled, and the Centre was showing a high presence of vacant units. 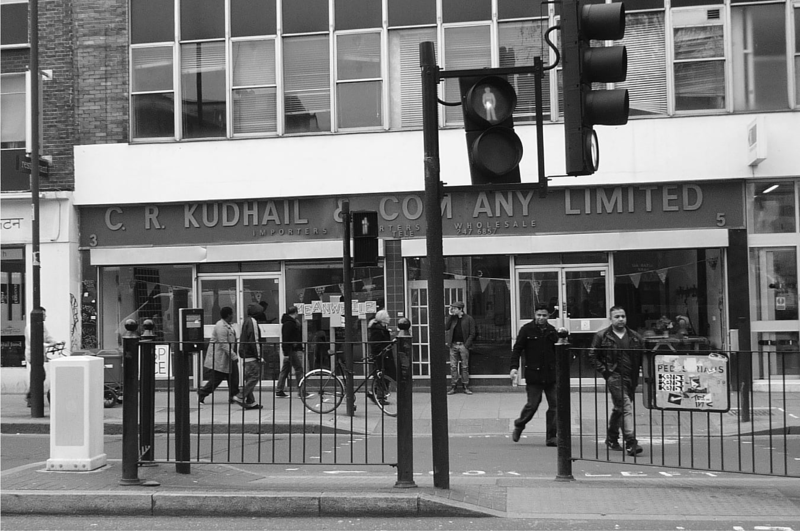 As part of an attempt from management to counter negative perceptions of inactivity and danger, partly linked to the presence of the nearly vacant Heygate Estate, a string of vacant shops were leased rent-free on a temporary basis for practitioners and cultural organizations to deliver a range of public cultural and artistic projects. Between 2008 and 2012, vacant spaces in the Centre were used for a variety of art and community projects ranging from pop-up theatre to temporary cinemas, to community mosaics workshops and art exhibitions, alongside more institutional uses of the corridors to display visual materials as part of the various local authorities’ public consultations around the proposed redevelopment plans. The visual appearance of many of these temporary shops reproduced the makeshift and ‘slow art’ aesthetics discussed earlier, and many projects used recycled and borrowed furniture such as benches, bean bags and second-hand sofas to create welcoming spaces. Engaging with local residents was seen as a crucial component for many projects and artists, and organizers attempted to physically transform the shops into more open and accessible spaces. Yet, physical accessibility did not necessarily translate into openness, as was discovered by Kay, a visual artist who ran a short-term art project in one of the empty units in the summer of 2011. After noticing that many visitors would stand outside the windows and look in but would not enter her space, she explained: ‘I opened up the big doors, and I opened all the doors so that it was, literally, people could just walk in’ (Conversation 15 February 2012). Despite her action, ‘what was really interesting was that people were then standing on the thresholds but they wouldn’t . . . they wouldn’t cross that. If I left them alone, they might, they might just cross over, and if I went talking to them they would just go away’ (Conversation 15 February 2012). The gesture of opening all the doors and the active attempts to engage with ‘the people who stand on the threshold’ did not translate into people crossing the invisible boundary of the space and becoming the kind of audience that she expected. Commenting on what she perceived as a disengagement, she speculated on the ability of the audience to ‘read’ the space: ‘There are some people who go “oh, it’s an art show in a pop-up shop” and come in and have a look, and know what they are doing, know what to expect, that’s fine. And then there’re other people who just . . . don’t know what to make of that at all, and so won’t come in’ (Conversation 15 February 2012). In her interpretation, the likelihood of people crossing the threshold is based on different degrees of familiarity with the format of an art exhibition in a pop-up shop, which presupposes a certain familiarity with the discourses of temporary reuse. The people who ‘know what they are doing’ and who ‘know what to expect’, and engage with the space without any need for an explanation, are those who possessed the cultural capital to relate with the space and ‘read’ its intended role of temporary interruption. In fact, she even wondered whether to those who ‘don’t know what to make of’ a pop-up, many of whom she identified as ‘locals’, ‘having these spaces, these pop-ups . . . means anything’ (Conversation 15 February 2012). A different interpretation, however, was offered through the encounter with a long-term resident who voiced a different reason for the withdrawal from entering and participating in the staged experience of the pop-up. Rather than an inability to read the purpose of the temporary use, his response indicated a more complex reflection on the space in relation to the controversial regeneration plans and their private and public promoters. Of particular significance in this context was the slow process of displacement and rehousing of the over 3,000 Heygate Estate residents. In Kay’s recounting of her conversation with the man in the shop, she explained her frustration: ‘[H]e would not believe that I didn’t have the plans for the Heygate [Estate] redevelopment. He wouldn’t really . . . and I was saying, no, I am not part of the Council, you know, and this isn’t the consultation xyz, this is an art project. I was a bit hurt that he couldn’t tell!’ (Conversation 15 February 2012). Although she was aware of the uncertainties surrounding the plans for regenerating the centre and the area more broadly, and the perceived lack of a forum to confront and question the local council and developers, she felt that it was ‘very odd’ that local visitors would assume that she was ‘part of the council’ and that she must know about the recent development on the regeneration plans. By challenging the performative frame of the pop-up, the unintended reading produced by the local visitor and his questioning of the artist’s position made visible the political implications of pop-up shops in the centre. In place of a performance of frictionless dialogue, it voiced the anxieties of local residents and traders affected by processes of displacement and redevelopment, as well as by the sense of uncertainty and lack of transparency that surrounded the regeneration plans. In relation to the plans to demolish or at least entirely redevelop the Centre, and contrary to expectations of exceptionality, the pop-up shop appeared as part of a strategy of temporary cosmetic interventions ‘in the meanwhile’. As critically argued by Vickery, community-oriented participatory practices in the context of regeneration are often enrolled to perform ‘an act of symbolic integration’ (2007: 77) against a backdrop of perceived or real social and economic exclusion. By not crossing the threshold and by questioning the practitioner about her relationship to the development plans, the visitors enacted a critical repositioning and withdrawal from the expected behaviour in the pop-up space as well as from its use as a device for the symbolic integration of a ‘community’ about to be displaced. Reading beyond the artists’ intentions, the visitors’ response pointed at the wider frame of the on-going agenda to reshape, with the redevelopment of the built environment, the social and cultural imaginary of the neighbourhood. In the context of the Elephant and Castle Shopping Centre, the temporary occupations of empty shops, with their ambiguous and carefully choreographed makeshift aesthetics and their affable attempts at engaging with the community, became easily aligned with the imaginaries of the coming redeveloped neighbourhood, and the activities of its ‘consulting’ promoters, as yet another sign of the gentrification to come. Over the last two decades the relationship between community-oriented artistic practices and urban vacancy has become commonplace, partially thanks to the circulation of ideas of ‘creative cities’ and culture-led regeneration; tactical urbanism, to which pop-up shops belong, has become the new vernacular of creative city discourse (Mould 2014). This vernacular of urban activities and associated sanctioned meanings has been spreading simultaneously at the level of practitioners and at that of policy makers and city promoters. Its success derives from its character of mobile paradigm for urban interventions that are easy to translate and apply to cities at many different scales across the globe. Pop-up shops and their ‘imaginative reconstruction of the city’ rely in their performance on a similarly mobile gaze. From private to public and public–private sector schemes, from self-initiated to policy-backed initiatives, the narrative of DIY appropriation of ‘wasted spaces’ presupposes a familiarity both with established global cultural tropes and with newly promoted urban trends. Such an informed gaze, in turn, is expected to produce a codified approach to the pop-up shop, which is predicated on a shared understanding of the rules of participation in a temporary urban cultural event. Practitioners across London have internalized such expectations, and in the reproduction of a shared pop-up aesthetics presume an unquestioned legibility of narratives of urban interruptions and alternative city experiences. In the course of this chapter, I have focused on embodied encounters and interactions across the reclaimed shop front in order to challenge expected readings by re-territorializing temporary interventions within localized processes of meaning-making. While there are significant differences between the social, cultural and economic positions from which the two unintended readings were produced, both unveiled the normalization at work in pop-up urban performance, and offered an entry point to expose a projected urban imaginary that attempted to sideline the conflicts and power relations inherent in the production of urban vacancy and its sanctioned temporary occupation. In the eye of the squatting community, emptied of its political and antagonistic elements the ‘alterity’ of the intermediary-led pop-up shop reclaiming of ‘wasted’ spaces revealed itself as one of appearances, but not of substance. Conversely, the community-orientation of the pop-up exhibition in Elephant and Castle was suspected of being complicit with processes of consultation, and of being aligned with the powers producing vacancy and preparing its re-occupation in the context of contested regeneration plans. To conclude, the pop-up shop vernacular has become a recognizable visual and performative ‘filler’ of urban vacancy, at times of recession and beyond. The urban imaginary it projects is now familiar to a global urban cultural audience that is expected to question neither the power dynamics at play in the production of vacancy, nor the future uses of the site after the ‘meanwhile’ interaction. Yet, the analysis of everyday encounters through the space can reveal perceptive challenges to the role of pop-ups in situations of heightened urban transformation. Beyond the spectacle for the global gaze, a critical and situated analysis of local dynamics and histories enables to extricate the often contested thick cultural politics of spatial interventions and offer insights into processes and practices of informed critique by those very communities and urban subcultures that temporary use practitioners gesture towards, but may be involuntarily complicit in displacing. Disappointment, withdrawal from participation, active questioning: the unintended responses to urban interruptions present a focal point that highlights the surfacing of conflicts generated by the double move of appropriating and emptying practices of unsanctioned and community-based spatial uses, within a framework and at the service of a continuous reconstruction of the built environment and imaginary of the city. Including the online Art and Architecture Journal, in the post Compendium for the Civic Economy, 13 May 2011.